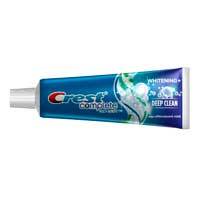 The first 15,000 people get a free sample of Crest Complete Multi-Benefit Deep Clean toothpaste. Also, 100 winners will each receive a Crest Complete MultiBenefit Whitening + Deep Clean Toothpaste, a Crest Complete MultiBenefit Whitening + Scope DualBlast Toothpaste, a Scope DualBlast Fresh Mint Blast Rinse, a Cross Action Power Toothbrush, and a Cross Action Power Anti Microbial Toothbrush! Thank You I Love Crest! I LOVE Crest toothpaste & I would really like to try this one! I would like to get a sample. I would love free sample! thanks, would love to get a sample. Samples are only if you Opt-In: “Bonus: The first 15,000 to select the opt-in below will also receive a free sample of Crest Complete Multi-Benefit Deep Clean toothpaste! Please note that samples are limited to only the first 15,000 entries. Yup but in the box it says if you’d prefer to enter the sweepstakes without starting a trial subscription to Good Housekeeping or if you are already a subscriber, click here. I did that and the next screen came up as though I subscribed. I did it the first time for myself, and it didn’t, and the second time for a friend and it did. I KNOW I entered without subscribing. I purposely tried it a THIRD time and it did the same thing…there must be a glitch because it doesn’t sound like I’m the only one it happened to. It allows you to unsubscribe with the e-mail address you used, but I hope they don’t mail it! Does it tell you if you are 1 of the 15,000 to get samples? I love crest and free samples! I brush like 4 times a day. Gonna need this! Like Crest. Love free samples. love crest.! would like a sample. Thank you. Hope there are some left. I love Crest the only toothpaste I use! CREST IS THE BEST !!! I would love a sample!!! Samples are gone it says. When I was growing up, my dentist always gave me a new tootghbrush and crest toothpaste. Crest is all I use in my house. Love it!!! !